Strongly built with a thick fur, huskies can withstand bitterly cold temperatures and are capable of lugging their share of supplies during long hours travelling across the endless tundra. Harnessed to a sled or simply keeping pace alongside their master, dogs made it possible for Inuit to cover great distances in their search for game to provide for their families, and to transport heavy loads otherwise impossible to move for a man alone, whether pulling the sled in the winter or on their backs in the summer. Although snowmobiles now make it possible to cover greater distances in less time than it takes by dog sled, they are not as reliable as a hardy team of huskies, which are also valuable guides, able to find their way better than any GPS, even in a complete whiteout. 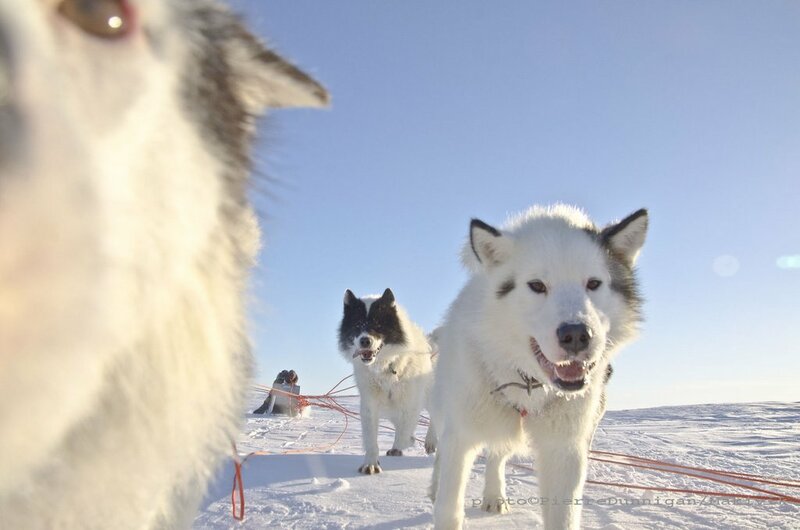 In a desire to bring back the dogs to Nunavik, Makivik, a corporation representing the Inuit of Nunavik, therefore decided in 2000 to organize Nunavik’s own dog team race, one that would pass through various communities. With the support of other northern organizations, in 2001, Ivakkak was born. Given its name by Mr. Johnny Watt, then Nunavik Governor and old time dog sled master, the first Ivakkak, an Inuit word that means “when the dogs are at their best pace” would begin on the Hudson Coast, from Umiujaq to Puvirnituq, passing through Inukjuak. On the morning of the start, excitement peaked on the sea ice, where the whole community of Umiujaq and more were gathered to witness this historical event. Exhilarated, children and teenagers could finally picture the many stories told by their grandfathers, as it would now take place before their eyes. Admiration shone in their eyes as they watched the dog teamers preparing to depart on a glorious journey, already thinking of the day it would be their turn. The race hadn’t even started and already Makivik had reached its goal: these kids might just grow up to raise their own dog team and bring back a millennia-old tradition to the present day modern life of the Inuit. All in line, waiting for the start to be kicked off, 82 dogs were pulling on their rope, leaping and yelping, eager to go. At last, the flag was dropped, high up in a bright blue sky as the count down is given: 3, 2, 1… Uit, uit! All in line, waiting for the start to be kicked off, 82 dogs were pulling on their rope, leaping and yelping, eager to go. At last, the flag was dropped, high up in a bright blue sky as the count down is given: 3, 2, 1… Uit, uit! As the nine teams left town in this mass start, many recalled the grief from when their dogs were killed, back in the 1950s and 1960s. But the dogs were back; these men leaving on their qimutsik had given back the people their dignity. This first race’s itinerary followed a route that was once used by Inuit sled dogs masters hired by the Hudson Bay Company to deliver mail between the northern communities and the South. For the men participating in this race against time, it was some sort of pilgrimage on their ancestors’ trail. The competition was really just an excuse: most men were just grateful to partake in such an uplifting adventure, sharing a passion with others alike. As only the Inuit of Nunavik had the privilege to participate in this inaugural event, the everyday en route routine became a real celebration of their culture. Covering an average of 40 miles a day, when the mushers reached camp after being alone with their dogs for the most part, they were happy to share a hot cup of tea with fellow Inuit. A support crew already ahead on snowmobiles, the men didn’t have to worry about setting up camp or chains for their dogs. Often they would even find fresh game meat or fish waiting for them to feast on, as their snowmobile partners had gone hunting for food along the trail. Every evening was then spent taking care of the dogs, fine tuning the sled runners, checking and repairing equipment. Some would even spend time carving soapstone. When it started to get dark, everybody would gather under a tent and recollect their day’s experience together, while planning for the next day. Aside from the snow machines, Coleman stoves and other modern appliances that the Inuit had introduced into their lifestyles, life out on the land was still the same. Out there, these men found peace of mind, connecting with who they really were. Each would ultimately fall asleep to the sound of the dogs howling in the night, dreams filled with joy of a culture still very much alive. When the dog teams passed through Inukjuak and then reached Puvirnituq, the triumph of this strong culture of the Inuit could be found in the people’s happy faces, as they surrounded the dogs and their masters. When Tamusi Sivuaraapik, then 60-year-old, but since then deceased, crossed the finish line with his team of fine Inuit dogs, after covering a distance of over 275 miles within a week, the crowd’s collective pride gathered at the village edge. The Inuit had shown that no matter how the world would change, their traditions would always survive.